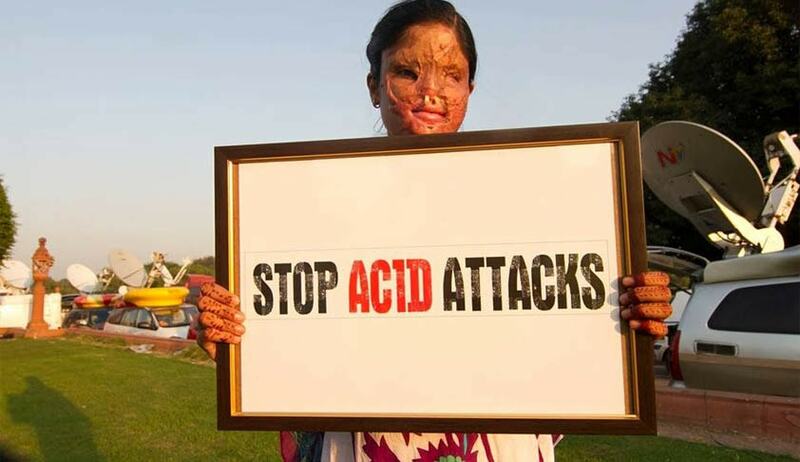 The Supreme Court on Monday set aside Hyderabad High Court’s order that reduced the sentence imposed on a convict in an acid attack case to the period already undergone. A division bench of Justice Dipak Misra and Justice R Banumati allowed the appeal filed by the victim in the case. The victim/appellant, after completion of her intermediate course, had accompanied her brother to Amalapuram of East Godavari district where he was working as an assistant professor in BVC Engineering College, Vodalacheruvu, and stayed with him about a week prior to the occurrence. Thereafter, she along with her brother went to his native place Sompuram. At that time, the elder brother of the accused proposed a marriage alliance between the accused and the appellant, for which her family expressed unwillingness. To take revenge, the accused trespassed into her house and poured a bottle of acid over her head. The trial court held him guilty under Section 326 and 448 IPC and sentenced him to suffer rigorous imprisonment for one year and directed to pay a fine of Rs. 5,000 with a default clause under Section 326 IPC, and sentenced him to pay a fine of Rs. 1,000 for the offence under Section 448 IPC with a default clause. In appeal, the high court modified the sentence to the period which the accused has already undergone. As per the records, the period of custody suffered by the accused was just 30 days. According to the Supreme Court, the centripodal question in the case is whether the high court has kept itself alive to the precedents pertaining to sentencing or has been guided by some kind of unfathomable and incomprehensible sense of individual mercy absolutely ignoring the plight and the pain of the victim; a young girl who had sustained an acid attack, a horrendous assault on the physical autonomy of an individual that gets more accentuated when the victim is a young woman. “......the approach of the High Court shocks us and we have no hesitation in saying so. When there is medical evidence that there was an acid attack on the young girl and the circumstances having brought home by cogent evidence and the conviction is given the stamp of approval, there was no justification to reduce the sentence to the period already undergone. “We are at a loss to understand whether the learned Judge has been guided by some unknown notion of mercy or remaining oblivious of the precedents relating to sentence or for that matter, not careful about the expectation of the collective from the court, for the society at large eagerly waits for justice to be done in accordance with law, has reduced the sentence,” it said. The bench has set aside the high court judgment and restored the sentence imposed by the trial court. “when a substantive sentence of thirty days is imposed, in the crime of present nature, that is, acid attack on a young girl, the sense of justice, if we allow ourselves to say so, is not only ostracized, but also is unceremoniously sent to “Vānaprastha”. It is wholly impermissible,” the bench remarked. It also directed the accused to pay a compensation of Rs 50,000 and the state to pay a compensation of Rs 3 lakh to the victim.